5 FULL Days of Microsoft Excel training divided into easy to learn half day courses. We separated our Microsoft Excel training courses into half day courses to adapt to how HUMANS learn, not because we have to allocate a trainer and training rooms by the DAY! That’s why we’re an ONLINE only Excel Course provider – you get more course content, delivered in a format which makes it easier to learn and easier to fit into your busy HUMAN life. * Our online Microsoft Excel training course includes everything. Each of our Microsoft Excel Training Courses are designed as a half day training session for the training centres we use to operate in Sydney between 2000 and 2006. Although we include all of these 9 courses for the one low price we’ve demonstrated below how they are usually separated into Beginners, Intermediate and Advanced Excel Courses. Are you a beginner to the Microsoft Office suite of programs and would like to learn all of these programs in one course? That’s why we created the Microsoft Office Beginners Essentials Courses – a fantastic way to get a solid understanding about how to navigate, use and create documents, spreadsheets and presentations as well as manage emails, calendars, contacts and tasks. All of these courses are available for one low price with 12 months access and the option or a certificate if you want one. Check out our specials page to see if you are eligible for a discounted price on Excel Courses! Get all the learning tools, start straight away and have a resource for 12 months or life. *** CURRENT OFFER: Enrol into the Excel Course and Certificate and receive the Microsoft Word Course for free! Our course includes Microsoft Excel knowledge reviews to test your new skills and provide you with the learning resources to review your answers and go over the learning material again if you need to. Learn more about how the online course works. 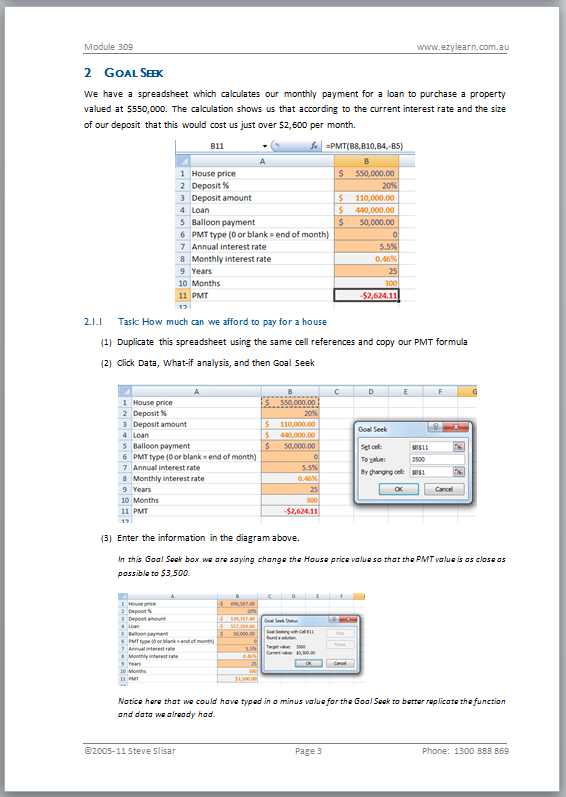 We’ve only supplied these course outlines as Excel Beginners, Intermediate and Advanced to help demonstrate the value of our Microsoft Excel Courses because we include EVERYTHING for one low price. If you are an intermediate Excel users you may learn something from the Beginners courses and focus on the Advanced courses and if you are more advanced you can brush up on the skills taught in earlier courses. Why do some training companies still offer these Microsoft Excel courses separately! Each of the 9 Microsoft Excel courses is divided into sections of explanatory videos (real life using of the exercise files and the software) followed by Knowledge Reviews that are designed to test your knowledge of the features taught in that section. We have all the training methods covered, AND you can go over and over the training materials as often as you want during your membership period – Did we mention that we have a LIFETIME course access option? We had the information we knew – that Absolute Beginners and Excel were the most popular courses and that we could offer these courses in the morning, just after lunch or in the evening. You’ll be able to use our exact data in a Pivot table to see when students like to come to a training centre to do a course – we used this information to schedule our courses up to 6 months in advance! Our Online Microsoft Excel Training Course Comes With the Assurance of A 30-Day Money Back Guarantee.